Of course, comparisons are never fully dispositive. The death toll among the Jewish inhabitants of the Ghetto as a result of deportations to concentration camps and the razing of the Ghetto was more than 300,000. The Ghetto itself was almost entirely leveled during the uprising in 1943, when the Germans systematically burned and blew up the ghetto buildings, block by block, rounding up or murdering anybody they could capture. the Arab-Israeli War. As a result, The Palestinians are the only refugees in the world that have been given hereditary refugee status. There are two compelling factors that stand out in any examination of the crisis in Gaza: the persistent intransigence of Israeli Prime Minister Benjamin Netanyahu, and the Israeli unwillingness to pursue a diplomatic and political solution to the Palestinian tragedy. Like a long line of Israeli politicians, Netanyahu favors total humiliation of the Palestinian people. He also is willing to humiliate and embarrass the only nation in the world that is willing to support Israeli with military and economic assistance-the United States. Netanyahu has ignored U.S. calls for a halt to the illegal building of settlements on occupied territory, and Israel has even timed the announcement of new settlements to the presence in Israel of high-ranking U.S. officials, including Vice President Joe Biden. Former Israeli Foreign Minister Abba Eban once said that the Palestinians “never miss an opportunity to miss an opportunity.” Now the same can be said for the Israelis. Prime Minister Netanyahu has repeatedly embarrassed Palestinian President Mahmoud Abbas, who is dedicated to a peaceful solution to the crisis. President Abbas offered Netanyahu one more opportunity in April, when he created a Palestinian “national consensus” government with Hamas. The Palestinian authority and President Abbas set the terms for the new government, which included a Palestinian pledge to nonviolence, adherence to past agreements, and even recognition of Israel. These terms were designed not only to appeal to Israel but to meet the demands of the United States and its European allies. According to Nathan Thrall, a senior analyst at the International Crisis Group covering Gaza, Israel, Jordan and the West Bank, Israel opposed U.S. recognition of the new government and sought to isolate the Palestinians internationally. President Netanyahu is now using overwhelming military force to terrorize a civilian community in order to return to the status quo ante that limits Gaza’s use of electricity, forces sewage to be dumped in the sea, makes sure that water remains undrinkable, and ensures fuel shortages that cause sanitation plants to be shut down. He thus ensures the perpetuation of desperation among those forced to live in these conditions. Such desperation would lead any human being to believe that violent resistance is the only recourse. 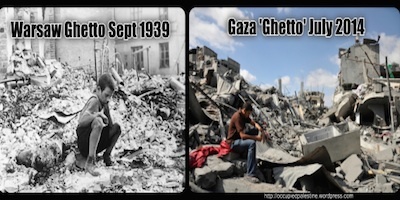 Perhaps the comparison with the Warsaw Ghetto is not completely far-fetched after all.